The launch of the Hire Bike Scheme has seen the Cycle Superhighways pale into relative insignificance. Which is just as well. Or perhaps it's just that the blue paint is fading faster than expected in several parts. 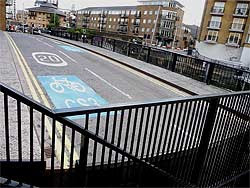 Anyway, I took a spin along CS3, Barking to Tower Gateway, the other day. The bit along Cable St is good (though of course it's only a blued-up and smoothed-over version of the mile of separated cycle track that was there already). At Limehouse Basin the strange contraflow maze is still entertaining topologists, with surprising gems like this Continental-style wrong-side-of-the-road challenge here. Also at Limehouse Basin is a swing bridge. If you're unlucky, it's swung when you arrive, and you have to wait a couple of minutes while river traffic shuttles between basin and Thames. Now, the devious blogger might take a picture of it in this state, and make a cheap crack about the CS3 not being continuous when it has this barrier across it. That would be unfair. No. 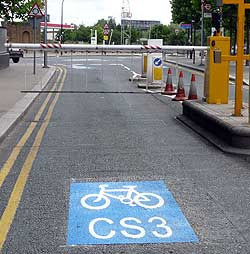 The actual barrier across the CS3 is further on, here in East India Dock. If you can find it after the blue paint mysteriously runs out for a few hundred yards. If you're not sure which way to go, simply get a camera out and pretend to take a picture. Within seconds, a security guard will rush out and shout clear, firm instructions for you to clear off or he'll call the police, pointing the way helpfully with his fist. Really? 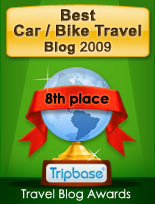 Nothing good to say about CS3 at all? To be fair it does get a little confusing around Canary Wharf but that's only for people who are following CS3 for the sake of it. People that are going somewhere specific will presumably work out the route and just be pleasantly surprised if CS3 matches it. I'll happily cycle on the right (wrong!) side of the path if it means avoiding the traffic for a while. 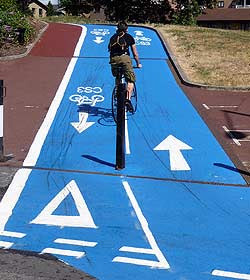 I think cyclists are usually pretty casual about sides when its just a pure cycling path. As long as everyone passes on the right side it's all cool, no? As for the barrier, I suppose they could make the bike path bump up onto the path for a few meters but is it really that big a deal to have to wait for the man to lift the barrier? Elan... you're easily pleased. However with a little bit of thought these routes could have been smooth, continuous and easy to use. As it is they are not are they. 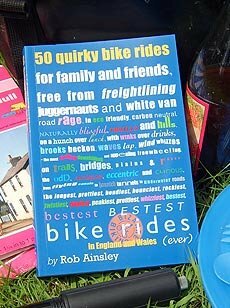 Theres no priority for cyclists, no removal of any parking in them, and no blue at the junctions where its really needed. No advance traffic lights for cyclists, no green waves. That weird wrong sided part around limehouse has just had blue paint put on the existing green. It could have easily been resolved by moving the parking bays and increasing permeability for cyclists and pedestrians. Still its a start, about 20 years late, but its a start. 1) There's a shortcut over the lock if the bridge is opened. 2) I am wondering why on cable street in some places the perpendicular roads get priority over the cycle path, if they have to yield to the traffic on the road parallel to the path. However cable street is a pleasure and I wish we had infrastructure like this everywhere. Last night I turned down the steep part of CS3 shown in the first picture, and Boris's magic blue paint had rendered the rainy surface really slippery. I have a nice gash on my arm to show for it. Elanthius, the contraflow makes you cycle on the wrong side of the one-way road, not of the path. Drivers just don't expect you to be there and cyclists get caught out. There was a petition and a 'protest ride' of some sort to get it fixed. Apparently the residents' parking shouldn't be there and the council tried to move it to the other side but the residents wouldn't play ball. waiting for a car barrier where there is (or should be) space for a cyclist to go past is a very big deal IMO. what for - taking a picture in a public area - a completely legal activity!